Please Note: This ammunition is loaded for modern firearms that use higher pressure smoker less powder loads. This is “ NOT” for older firearms that use lower pressure black-powder ! Box of 50 Cartridges, not 20 cartridges like many brands. 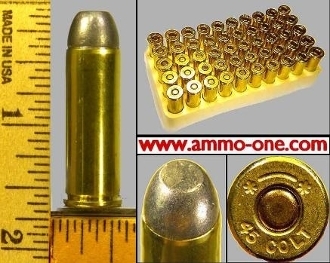 One Box of 50 Cartridges: 45 Long Colt, new, made with new Starline brass cases and 200 grain Lead projectile. Please Note: For single cartridges for collectors please see below in realted items. History of the 45 Colt Cartridge: The famous cartridge that won the west. The 45 Colt, a.k.a. 45 long Colt and Colt Peacemaker revolver are well know for the pistol that won the west. The 45 Colt was introduced in 1873 as one of the cartridges for the Colt Peacemaker revolver, adopted by the U.S. Army in 1873 and used until 1992 until replaced with the 38 Long Colt. It is still a very popular cartridge today. Also use as a Rifle cartridge.